ATLA and Southwestern Area Theological Library Association (SWATLA) invites theological librarians in the Southwestern US and beyond to join them at their virtual meeting to hear plenary speaker Kathy Dempsey discuss “What They Didn’t Teach in Library School: The Cycle of True Marketing” on April 12, 2018, at 1:00 pm CDT. Have you been tasked with marketing library events or services without ever having a course that taught you how? If so, you’re an “accidental marketer,” and you’re not alone! 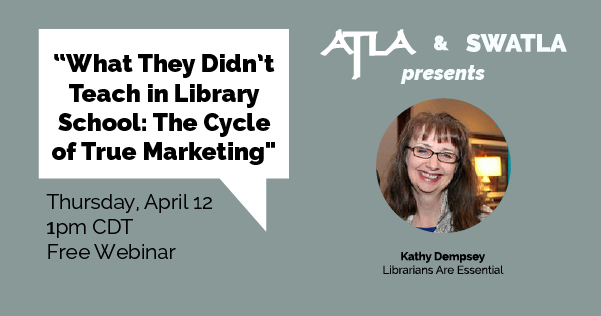 This webinar will give you a solid foundation in the tenets of library marketing, covering definitions, strategies, reasoning, and the steps in the Cycle of True Marketing. What’s the difference between marketing, public relations, promotion, and advocacy? Why didn’t anyone come to the event that I worked so hard on? Wonder no longer; this is the “Marketing 101” lesson that will help it all make sense! In 2005, Kathy founded the consultancy, Libraries Are Essential. Her niche is library marketing, promotion, and public relations. Most of her work is in writing, training, consulting, speaking, and blogging on those topics. Kathy authored The Accidental Library Marketer and offers an array of resources on her website. This event is funded by a Regional Grant to SWATLA from the ATLA Professional Development Committee.